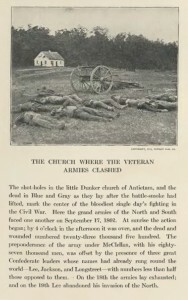 Photographic illustration plate “The Church Where the Veteran Armies Clashed” that includes a photograph of casualties from the Battle of Antietam. Page 6 of The Photographic History of The Civil War, Francis Trevelyan Miller, ed. Available in the Rare Books Online collection. Ric Burns’ film “Death and the Civil War” is scheduled to premiere as part of PBS’ American Experience series on Tuesday, September 18, the 150th anniversary of the Battle of Antietam (check your local public television listings for the exact times). Based on the book This Republic of Suffering by Harvard president and Civil War scholar Drew Gilpin Faust, the show examines how the unprecedented and overwhelming number of Civil War casualties moved Americans both individually and collectively to better serve members of the armed forces who lost their lives in battle. At its start, the Civil War was expected to be a short and relatively bloodless military engagement. Instead, the war lasted four years, and had an enormous death toll of 620,000–the equivalent of the total number of soldiers lost in every other American war from the Revolution through Korea combined. Before the war began, there were no formal procedures established to identify soldiers killed in the line of duty, or to notify their next of kin. The problem was staggering–approximately half of the men who lost their lives in battle during the Civil War were never identified; this brought additional suffering for the families of soldiers who never received any official notification of how, when, or where their loved one died, or was buried. Public response to the horror and confusion caused by failed communication amidst such intense grief and loss engendered the establishment of services and institutions to serve the wounded, the dying, the dead, and their families. Approximately 120,000 Georgians served the Confederacy during the Civil War; 11,000 to 25,000 of these soldiers died on battlefields, or in hospitals from wounds and disease. Although most of the casualties were Confederate soldiers, there were also a significant number of Union soldiers who died in Georgia. Because so many of these men were unidentified and because the staggering death toll overwhelmed local resources, many of these soldiers were buried in mass graves adjacent to their last battle sites. To address this problem, a massive federal reburial program took place between 1865 and 1871. Seventy-four new national cemeteries were created for Union soldiers with federal funds, and more than 300,000 men were ultimately relocated and reburied. The federal government, however, did not recognize any Confederate dead in these efforts. To address this exclusion from the services of the federal government, white Southern women raised private money to repatriate dead soldiers from border and Northern states and bury them in Southern cemeteries. Organizations like The Daughters of the Confederacy funded improvements to Confederate burial sites that included replacing wooden memorial markers with more permanent marble gravestones, and installing cast-iron replicas of Confederate medals at the tombstones of veterans who served honorably during the Civil War. African American soldiers who belonged to U.S. Colored Troops (USCT) regiments (and accounted for ten percent of the Union Army at one hundred and eighty thousand soldiers) were also difficult to identify at death, given the lack of personal identification and burial details that impacted all soldiers. Additional confusion surrounded the burials of some of the forty thousand African American casualties due to their status as African American men. Some remained in public or freedmen’s cemeteries; some were re-interred several times prior to burial in segregated sections of national soldiers cemeteries. More than 3,500 black Georgians served in the Union army and navy between 1862 and 1865. After the Civil War ended, Congress passed legislation to establish ambulance services; federal hospitals; official systems for identifying soldiers and communicating with family members; national military cemeteries; and Memorial Day remembrances; many of these practices and institutions remain in place to this day. Photograph of Confederate cemetery, Marietta, Cobb County, Georgia, ca. 1941. Vanishing Georgia, Georgia Division of Archives and History, Office of Secretary of State. Available in the Vanishing Georgia digital collection. Most Georgia cemeteries contain graves of Confederate soldiers or veterans, but some have entire sections dedicated to those who lost their lives in the Civil War. The Andersonville cemetery cemetery originally served the 13,000 soldiers who died in the Andersonville prison, the nearby prisoner of war camp. Today nearly 20,000 soldiers are buried there. Marietta includes both a national (Union) cemetery and a Confederate cemetery. The national cemetery contains around 10,000 Union soldiers, who died during the Atlanta campaign–only 7,045 of whom are known. The Confederate cemetery, established in 1863, is the largest Confederate cemetery in the state. 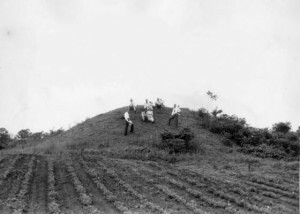 It holds 3,000 soldiers who were recovered and reburied at the site. 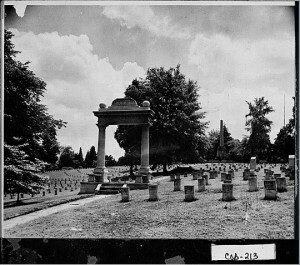 Originally designed as a six acre rural garden cemetery and named the Atlanta Graveyard or City Burial Place, Oakland Cemetery was given its current name in 1872, after the city and the Confederate government added another 42 acres of land to accommodate casualties of the Civil War who had died in local hospitals. Westview Cemetery actually saw battle during the Civil War (it was the site of the Battle of Ezra Church); 400 Confederate veterans are buried here. Located in Griffin, Georgia, Stonewall Confederate Cemetery is the burial site for several hundred Confederate soldiers and one Union soldier; most of these men were casualties of the Atlanta Campaign. Both of these cemeteries are located in Bartow County. 250 unknown Confederate and 2 Union soldiers are buried in Kingston Cemetery, and 300 unknown Confederate soldiers buried in Cassville’s town cemetery. 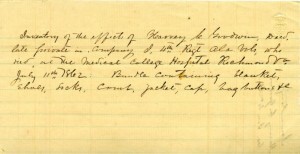 Inventory of the effects of Harvey C. Goodwin, who died at the Medical College Hospital, Richmond, Va., July 11, 1862. Sanger Historical Files (1859-1865), Excerpts. Special Collections and Archives, Tompkins-McCaw Library, Virginia Commonwealth University, Richmond, Va. Available in the Civil War in the American South digital collection. In recognition of the sesquicentennial of the start of the American Civil War, Civil War in the American South provides a central portal to access digital collections from the Civil War Era (1850-1865) held by members of the Association of Southeastern Research Libraries (ASERL). ASERL members hold deep and extensive collections documenting the history and culture of the American South, developed over hundreds of years to support scholarly research and teaching. 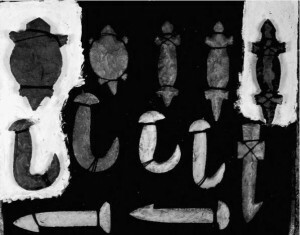 Many of the special or unique manuscripts, photographs, books, newspapers, broadsides, and other materials have been digitized to provide broader access to these documents for scholars and students around the world. 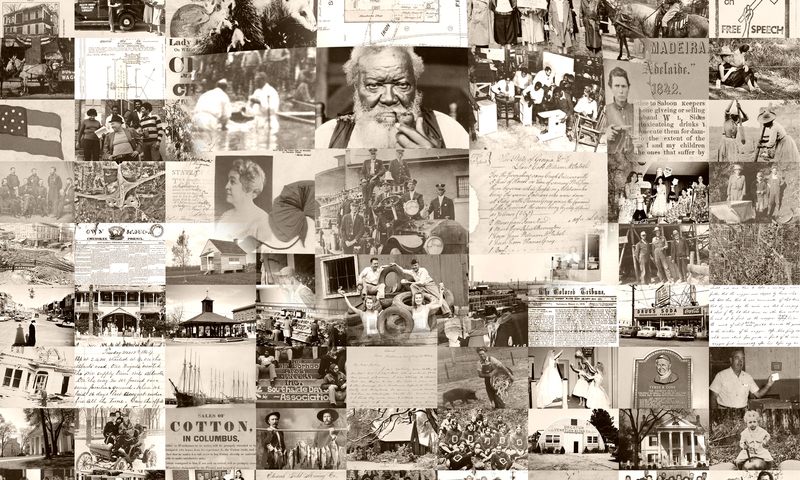 Civil War in the American South is a collaborative initiative to provide a single, shared point of access to the Civil War digital collections held at many individual libraries. More than 30 libraries have contributed resources to this effort. Archival materials documenting the Atlanta Campaign and the defense of Savannah; the Eastern Theater and Western Theater outside of Georgia; Confederate government records and correspondence of its prominent officials; life on the homefront; slavery; and the Civil War in memory. The records include the diverse experiences and perspectives of military leaders, soldiers, and civilians whose lives were directly impacted by the Civil War. Thousands of first-hand accounts of Union and Confederate soldiers and officers document their hardships and opinions of the war and national politics. Military documents, including orders issued by William T. Sherman, describe the strategy of the Atlanta Campaign. Letters and diaries from Georgia civilians, young and old, male and female, describe in compelling detail the anxiety leading up to the war, the blockade of Georgia’s coast, the siege of Atlanta, and General Sherman’s subsequent march through Georgia. 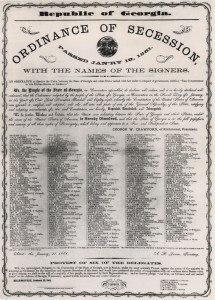 Financial and military documents reveal details of the buying and selling of slaves by private parties and by governments in the defense of the Confederacy. Letters, questionnaires, and 20th-century photograph collections capture the memories of Civil War veterans and document important Georgia Civil War landmarks a few decades after the conflict. Includes a variety of important documents and artifacts from the American Civil War held by the Hargrett Rare Book and Manuscript Library. The site contains images of the sixty-one albumen prints found in early American photographer and member of the Matthew Brady studio, George N. Barnard’s Photographic Views of Sherman’s Campaign, ca. 1866. Subjects of the photographs include Sherman and his generals, Nashville, Chattanooga Valley, Atlanta, and Savannah. Barnard was the official photographer for the United States Army, Chief Engineer’s Office, Division of the Mississippi. See a previous DLG B post on Barnard’s Photographic Views of the Sherman Campaign, ca. 1866 here. This collection presents documents related to all aspects of Southern life during the Civil War. In particular, government and civilian publications demonstrate the Confederate States of America’s unsuccessful attempt to create a viable nation state. This collection includes over four hundred Civil War era maps, broadsides, photographs, printed works, Confederate currency, and manuscript letters and diaries. Documents the individual and collective story of the African American struggle for freedom and human rights in the eighteenth, nineteenth and early twentieth centuries. 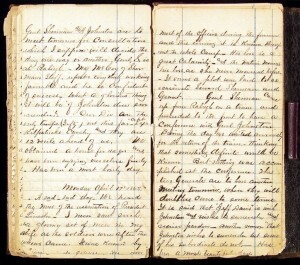 Civil War diary of Lieutenant (later Captain) Cornelius C. Platter, of the 81st Ohio Infantry Volunteers, from November, 1864 – April 27, 1865. Platter’s diary details Sherman’s march through Georgia from Rome to Savannah and the march north through the Carolinas. He gives dates, times, and lengths of marches and describes the weather, locale, scenery, and food as well as orders, rumors, positions, troop morale, and administrative duties. The diary also includes a description of the burning of Columbia, South Carolina, the news of the Confederate surrender, and the assassination of Abraham Lincoln. Personal diary of Confederate private Cyrus Franklin Jenkins, of Company B, 13th Regiment, Georgia Volunteer Infantry. He was killed at Spotsylvania, Virginia, on May 12, 1864. 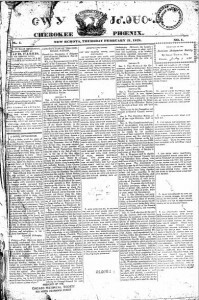 The following Georgia historic newspapers include coverage during the Civil War period, provide full-text searchable articles, and can be browsed by date. They provide a primary source perspective for investigating daily life on the homefront, the impact of the war on Georgia cities and towns, casualty lists, political events, and eyewitness coverage of battles. Newspaper clippings collected by the Calhoun-Gordon County Library as part of the Gordon County, GA Obituaries project. The source of the obituary clippings is the Calhoun Times and previous Gordon County newspapers no longer in print; the time coverage of these materials spans from 1800 to 2007. 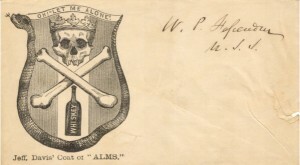 Printed envelope “Skull and Crossbones” with a parody of a coat of arms for Jefferson Davis, president of the Confederate States of America. Alfred S. Lippman Collection of Civil War postal covers, Manuscripts Collection 993, Louisiana Research Collection, Howard-Tilton Memorial Library, Tulane University, New Orleans, Louisiana. Available in the Civil War in the American South digital collection. 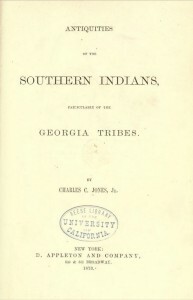 Text-searchable books related to Georgia’s history and culture published prior to 1923; many of these publications cover history, biography, and literature of the Civil War period. A keyword search for “civil war” retrieves 39 works. This collection includes 7 titles that cover the Civil War as a subject area. which contains The Photographic History Of The Civil War (Francis Trevelyan Miller, ed.) and other digitized book material from the Hargrett Rare Book and Manuscript Library. This collection endangered historically significant photographs ranging from daguerreotypes to Kodachrome prints spans over 100 years of Georgia history and includes 251 photographs related to the Civil War. This collection contains four letters written in 1860 and 1861 by Southern author and Columbus native Augusta Jane Evans. The digitized collection Robert Toombs, Letters to Julia Ann DuBose Toombs, 1850-1867 consists of correspondence from Robert Toombs to his wife, Julia Ann DuBose Toombs in Washington, Wilkes County, Georgia from 1850-1867. During 1850-1859 his letters come from Washington, D.C. while he served in the U.S. Senate. During the Civil War, he wrote from Virginia (1862) and Atlanta, Georgia (1864). Following the war, letters are written from Paris (1866-67) while he was in exile. The correspondence generally discusses current events; his land holdings in South Georgia, Alabama, and Texas; people; other soldiers; and his wish to be with his wife and family. The digitized selections from the Joseph Henry Lumpkin Family Papers consist of letters dated 1850-1861 (the bulk of which are from 1852-1856) to Callie Lumpkin King, wife of Alabama lawyer and plantation owner Porter King and daughter of Joseph Henry Lumpkin. Correspondents include Sallie (Baxter) Bird, wife of Hancock County plantation-owner Edgeworth Bird; King’s husband Porter; Thomas Read Rootes Cobb, her brother-in-law; and other Lumpkin family members. The letters touch on family life, local and national politics, marriage, and the social life in Athens, Georgia. Available in the Historical Broadsides collection. 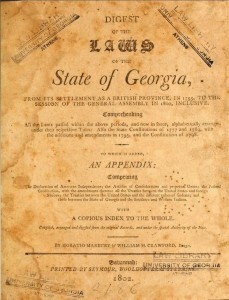 The New Georgia Encyclopedia contains 124 authoritatively-written entries (that include articles and photographs related to the Civil War that include events, the role of the war in Georgia, and historic Civil War sites located throughout the state. This calendar highlights Civil War (and related) events and how they impacted Georgians from November 6, 1860 through December 25, 1865. This digital collection includes early maps of colonial and revolutionary America to 1939 that depict Georgia cities and coastal areas and document transportation by rail, river, and highway; there are Civil War-era maps available in this collection. A broadside is a sheet of paper generally printed on one side only and typically used as a poster to announce some event, proclamation or other matter. The Hargrett Rare Book & Manuscript Library at the University of Georgia Libraries holds a collection of more than 2,000 historical broadsides from 1746 through the 1980s; there are Civil War-era broadsides available in this collection.